We have a new 20% discount for military and veterans! Please bring proof of status when signing up. Once you’re a member it becomes $28/month for adult/family and $17.60 for seniors. *Remember: At the Adorni, if you sign up as an adult, all your family members are included in membership. We will return to normal hours on Tuesday, November 13. Note: This is a corrected post. Originally, it said we would be open on Sunday, November 11 for our regular schedule. This posts corrects that error. We will be honoring all the men and women who have selflessly served our country at the Adorni Center on Veterans Day. Our featured speaker will be Major Eddie A. Morgan, U.S. Combat Army Engineers Retired. This observance and program are presented by the Rotary Club of Southwest Eureka in partnership with the City of Eureka. Please attend and please spread the word. Our featured speaker will be Captain Arthur Snyder USCG Commander, Humboldt Bay. 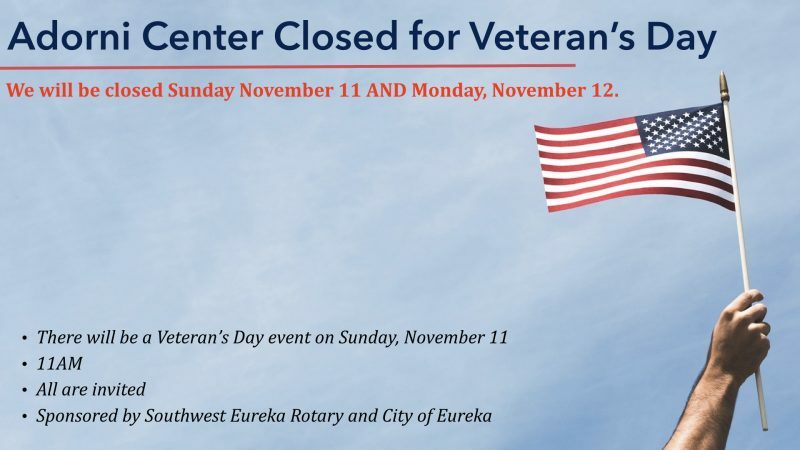 This observance and program are presented by the Rotary Club of Southwest Eureka in partnership with the City of Eureka. Please attend and please spread the word.